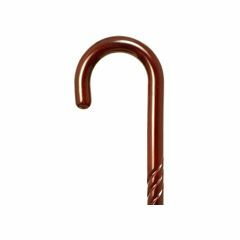 Spiral Tourist Rosewood Cane is 37" long. Supports Weight. Stores Easily. Easy To Use. Well Constructed. Lightweight. Safe. Indoors. Short Distances. Wet Weather. Outdoors. Long Distances. Supports weak, sore knee. Gives great support to weak, sore knee and bad hip. Very economical and yet attractive. Shipping time was unbelievably fast. Supports Weight. Stores Easily. Easy To Use. Well Constructed. Lightweight. Used everytime I leave my home. Well Constructed. Supports Weight. Safe. Easy To Use. This hospitalcane is most convenient because I can hang it over my arm to have two hands available, when need, while shopping. What is the dia.of this cane at the tip?